Drawing portraits has always been, and will continue to be one of the greatest aspects of drawing. I found my first serious love of drawing when I traveled to Florence, Italy. It was there that I saw the many artists drawing portraits on the street. I would stand and stare at their amazing technique - for me, watching them work was a new experience and one of my most cherished memories from my travels in Europe. I wanted to live the life of a portrait artist! They made face drawing fun, they made it look easy. After seeing these street artists at work, I knew immediately that I wanted to start drawing portraits and become a portrait artist myself. I began to look through catalogues, magazines and newspapers for interesting faces to draw. I thought I was doing great works of art, but in reality, what I was drawing, was not very close to capturing the sense of life that the Italian artists seemed to put to paper so easily. It wasn't until one of my art teachers asked me to draw a portrait for her that my real journey into drawing portraits and the human face would begin. She was honest and she was brutal. She verbally tore my picture to pieces, but this is exactly what I needed to spur me into action. What I want to give to you is the same thing that she gave to me - a simple path to follow to really start to bring your portrait drawings to life. 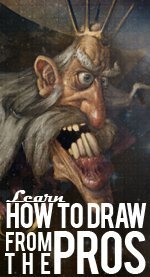 Like everyone learning to draw I'm sure that you're eager to get started so lets get to it. There is, in my opinion 6 important parts of the face that you must master if you are attempting to become a portrait artist. Master these lessons and I guarantee that you will set a new standard for excellence among your peers and colleagues. To start off with you will learn to draw the face from the front and side view. Basic human face proportion is what you will learn here. Don't forget to sign up to get the free course homework and updates! This lesson will cover drawing the head on three-quarter view. You will take the front and side views that you learned in lesson one and match them up so that you can start drawing the face from any angle. In this lesson you will review what you have learned in the first two lessons and see how the facial proportion guidelines work with real human faces. Now that you know how to draw the face from any angle and you've taken time to study photos of real faces, it's time to learn the last piece of the puzzle and add shadows to your face, giving it the realistic look that every artist strives for. How you start drawing your face is so important. If your goal is to improve your portrait skill, DO NOT MISS THIS LESSON! If you've been drawing faces for a while, and just can't quite figure out why your portrait drawings aren't looking quite right, then I urge you to read this lesson - I promise you that the quality of your work will immediately improve. How can I be so sure? Remember the old teacher who was so harsh on my early drawings? This is exactly where she started me, and where I began to see amazing results in my own drawings. After facial proportions, the eyes are the next important part of the face. So much expression is shown through the eyes, that if you get them wrong, your portrait drawing is going to seem lifeless. Don't get caught drawing sleepy-looking zombie people! Let me help you add emotion, expression and life to your drawings. The nose itself isn't that hard to draw, but when you begin to experiment with capturing your subject from different angles the nose may give you some problems. We're also blessed with so many different and interesting shapes of noses in the world that this is one of the areas of the face that you can really have fun to add a little bit of humor in your drawing. Mouths are one part of drawing portraits that I consistently have problems with. Drawing a simple, lifeless mouth is not very difficult. Adding a slight pout, a crooked smile, a sneer, or a scowl, is where the challenge really comes in. There's nothing that can't be solved with practice, patience and perseverance, so let's take those lifeless, botoxed lips and breathe a little life into them! What a truly bizarre shape the ear is. Where do you start? How can you make sense of these alien shapes and then add shading and lighting information into your drawing?! Seems impossible, but let me assure you it's easier than you may thing. I'll show you how to build a simple 'road-map' for drawing realistic ears that you can then use and apply to any portrait drawing. I said there were 6 important steps to drawing portraits, and even though I have listed hair as the last one, bad looking hair will ruin any face you try to draw, unless perhaps you intend to specialize in drawing portraits of bald men and women! Don't miss out on this last important lesson on your way to becoming a complete portrait artist.